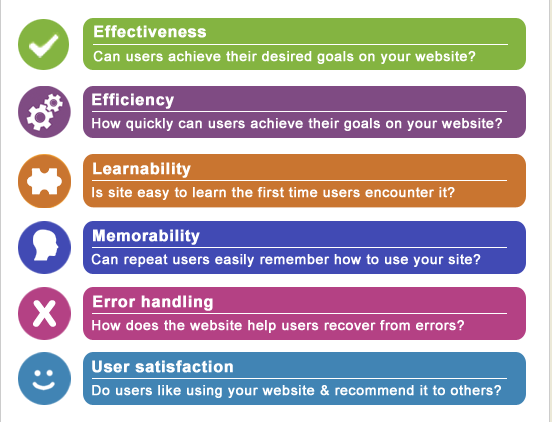 Why is Website Usability Testing Important? Testing a website's usability is fundamental to discovering what works and what doesn't work from a users perspective; for example, what keeps visitors reading, contacting you and enquiring and buying, or what causes them to leave and abandon your checkout before purchasing. When website owners do not test the usability of their site or ignore UX (user experience) issues that often reveal themselves in Google Analytics reporting, complacency can set in. Finding out how visitors behave and act on your website can help you understand their perception of your brand, products or services. This is the main objective of our (and any) website usability testing service. In our experience, small changes and tweaks to design, navigation or calls to action can yield big increases in page views, actions, dwell time, engagement and orders. Which Elements of Usability do our Tests and Audits Assess? Quality of copywriting - essential for website usability "calls to action"
Our test audits provide frank and honest advice and guidance about how your website's usability, UX, accessibility and navigation can be improved in order to provide your visitors with a positve experience. Usability audits are also helpful for businesses looking to re-design their websites from the ground up. It’s far more cost-effective to implement navigation, usability and structural best practices from the beginning of a new web design project, than when the website is about to go live. Why not, at the same time, order an SEO analysis of your site to get a clearer picture of your website’s SEO performance and current rankings? Our expertise in SEO, small business web design, link building, content writing, search engine marketing and implementing an internet marketing strategy means we’re uniquely placed to help you improve all facets of your online marketing, which will help you turn your website into a lead generating, customer ordering machine. If your website isn't as effective, functional, user friendly or as simple to understand as you would like or as much as your customers need it to be, contact us - we can discuss your needs and the next steps.